A book to define Africa’s soccer culture. 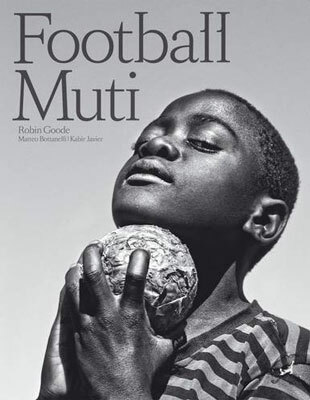 Football Muti is a photographic and written journey into the heart of Africa’s most beloved sport. More than just a study on the African sporting psyche, Football Muti define and reveal Africa’s soccer culture in the running up to the world cup. This journey is contained in a coffee table book. There’s a need to reveal the continent’s football culture for the first African world cup. A need to show the passion they harbour for the sport. To reveal the love of a simple game that drives the poorest of children to create hand-made footballs made of condoms (for extra bounce). To define the magic, the superstitions and why witch doctors are vital supporters during a local game. Africa is a wild, vibrant, colourful and enigmatic place – and its very definition is mirrored in its adoration of this sport. Football Muti reveal the real Africa at play; the kids on the street, the local team from a small village near Yendi in Ghana. That is where soccer’s beauty and purity is to be found in the children of the poorest places on earth. In July 2010, one in five people – more than one billion people – watch the same images on TV. Those images are of the first Football World Cup played in Africa – South Africa 2010. No other event in history has united the interest and affection of so many. Surpassing social status, education, religion, gender, ethnicity and race. Football Muti is a project aimed at generating funds for charities in Africa. Using the sport that gives so much to the continent. Football Muti raise funds to donate a variety of medicines to children’s charities. We cover production costs with sponsors, so that all funds that come from purchasing the book go directly to charity. Football Muti is not just be about soccer. It also be a social documentary. Focusing primarily on the soccer culture in Africa and secondly, on selected social issues concerning Africa’s children and Africa’s tomorrow: HIV, famine and unrest. The world cup is an opportunity to bring the world’s attention to the many beauties of Africa and to selective social issues. Football Muti give foreigners an opportunity and role in bettering Africa’s future. The production of Football Muti involve many journeys in its own right. The first step see the Art director Robin Goode and the photographer and designer Matteo Bottanelli travelling from Turin to Cape Town by land. A scouting trip, they investigating possible lead stories for the book. Taking photographs and acquiring initial editorial content. The objective is to donate 100% of the funds generated through the selling of the book to charity. We cover production costs with sponsorship funding. This project is about giving all that we can to those who really need it.